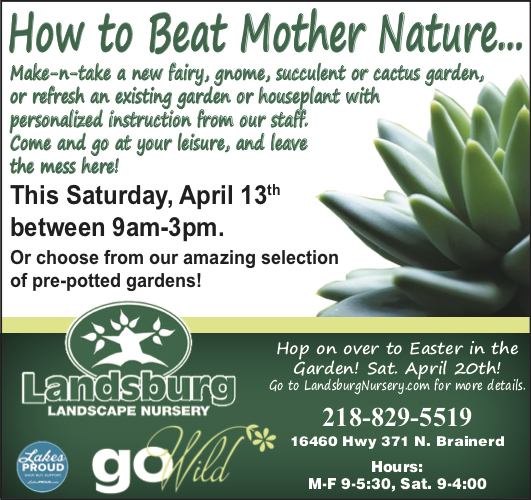 Landsburg Landscape Nursery | Landscapes for your Lifestyle! 40 Years and Still Growing! From planning and design, preparation and installation, to garden maintenance, you can trust Landsburg’s to create a lasting impression at your home or business. Who is caring for your yard and garden? Landsburg Landscape Nursery offers a maintenance program to fit a variety of needs and schedules. Search our online catalog to find the perfect tree, shrub, evergreen or perennial for your unique situation. We offer many teaching events here at Landsburg. Take a look at the calendar to see what's coming up. We hope you'll join us! Take a tour of our garden center, greenhouse and nursery! The garden center at Landsburg’s offers everything you will need to make your landscape a reality. Come see us. Bring your imagination, your enthusiasm, your questions and concerns. Landsburg’s yard & garden maintenance personnel are degreed horticulturists with extensive experience and are professional, reliable and ready to answer your questions. Protect your landscape investment with one of our quality maintenance programs!